Metal casting machines are used to melt, cast metal and designs the metals. There are different types of metal casting machines for casting of metal like iron, copper, steel, gold, silver, etc. From a small diameter rod to large billets can be produced. In recent years casting techniques are gaining relevance because of the concern for energy conservation and environment protection. With sophisticated casting techniques complicated designs can be produced with minimal material waste. Design of Metal Casting Machines: Different machines for sand castings, centrifugal casting, die castings etc. are available in the market that are of internationally high standards and can withstand high temperature application. There can be flexibility in terms of product profile and product alloy. Only minor changes are required to change the machine from strip to rod production. These machines can be used in difficult working conditions. Many innovative techniques can be used so that the machines can be used for different operations. Machines are designed to withstand challenges like disrupted electricity supply, non-availability of premium quality raw materials etc. Applications: Different machines are used of different purposes, like the continuous casting machine is used to manufacturing semi-finished rod, strips, tube and other items. The small table top machines are designed to process gold, silver and other alloys. Other common end products of casting machine are electric wires, bronze and brass hardware, copper products, jewelry, etc. Sand Casting Machines: In large foundries the removal of casts, finishing works and re preparation of sand is doneby automated machines. Production of components using moulds which are destroyed in casting (as in sand-casting) is predominantly performed manually. In order to increase productivity, machine aids are used for sand preparation, mould preparation and extraction of the finished workpieces. Machinesare used for the production of castings in casting boxes, the functions of which are to compress the sand around the pattern, through shaking and pressing, so that a good mould remains after the extraction of the pattern. The extraction of the solidified workpieces, their handling and the re-preparation of the sand, as well as the mixing of the various constituents of the mould sand, are all mechanized or even automated in the larger foundries. For further study on machines for sand casting, specialized reading is recommended. Pressure Die Casting Machine: In pressure die casting, the liquid metal is injected into the mould under high pressure. This high pressure is maintained during solidification by the utilization of piston/cylinder systems. As a result of the relatively rapid injection velocities which are possible, complicated components with thin and varying sections can be produced. The high surface finish of the mould reproduces high surface finishes, as well as dimensional accuracy, on the work. The construction of a pressure die-casting machine basically consists of two main components. A mechanized frame carries the two parts of the mould, which must be opened to eject the work. The second main section is the metal-injection echanism with ancillary devices. The clamping forces, as well as the casting-pressure forces, combine to put the machine frame under heavy stress, and it is therefore frequently constructed with the use of heavy round pillars and massive platens. Pressure die-casting machines are available with maximum closing forces of up to 30 MN and with pressure chamber volumes up to 0.03 m.
Continuous Casting: In continuous casting machines the components distribution vessel, mould, support and drive roller are arranged one below the other. 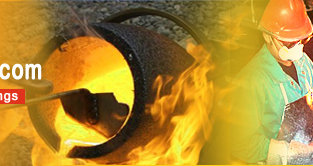 The vertical continuous casting machine enables easy and safe cast operation. The mechanical properties of a component are dependent among other things on the density of the material structure, and therefore are influenced by the pressure under which the liquid metal is solidified. 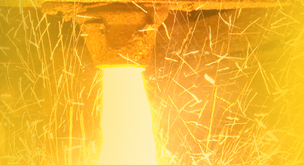 Gravity Casting: In the case of gravity casting machines, the pressure of the liquid is dependent on the pouring height. However, when centrifugally cast, the pressure of the liquid metal is markedly increased by the centrifugal acceleration of the rotating iron mould, which may be several times greater than gravitational acceleration. When casting in grey iron, centrifugal casting can result in increases in ultimate strength Rm at about 50%. Casting machines or metal casting machines can convert scrap of almost all alloys, which helps in cutting down cost drastically. Recycling of expensive scraps can be done, thus enabling minimum scrap wastage. Produce components with intricate designs, but with minimal material waste.